Blog-checking Lines: Jana ofCherry Tea Cakes was our July Daring Bakers’ host and she challenges us to make Fresh Frasiers inspired by recipes written by Elisabeth M. Prueitt and Chad Robertson in the beautiful cookbook Tartine. This was a really fun challenge! 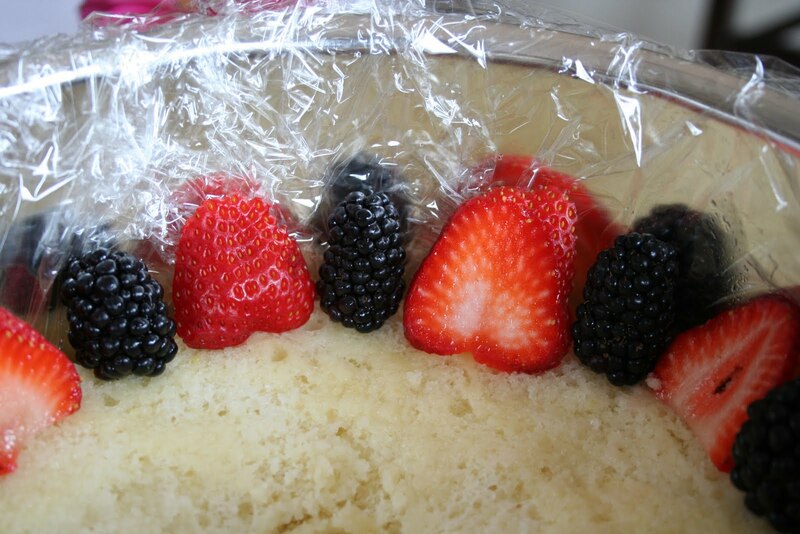 We had to create a delicious cake where the middle layer had exposed fruits around the outside. 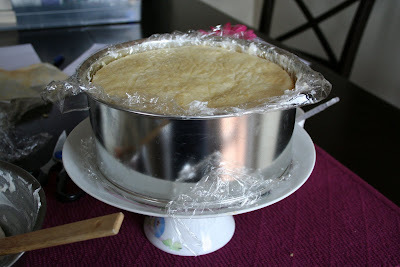 We also had to make each component of the dessert by hand: the chiffon cake, pastry cream mousse, and the simple syrup! 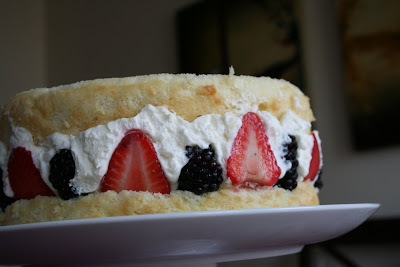 This was my first time making a chiffon cake, and I am hooked! 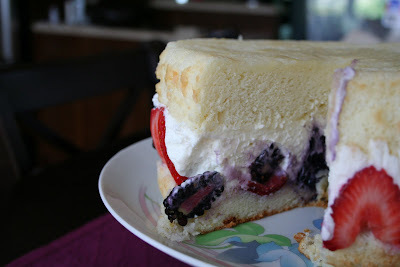 I loved how light this cake was, it was the perfect complement to the pastry cream and fresh fruit. I chose to make a citrus chiffon cake because I love desserts with a twist of citrus to them. 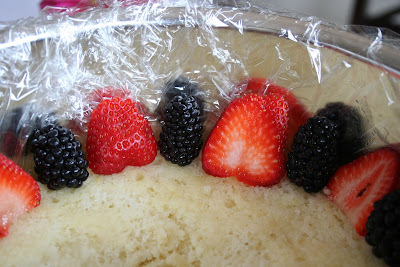 I filled my middle layer with strawberries and blackberries, they were so good in this dessert! 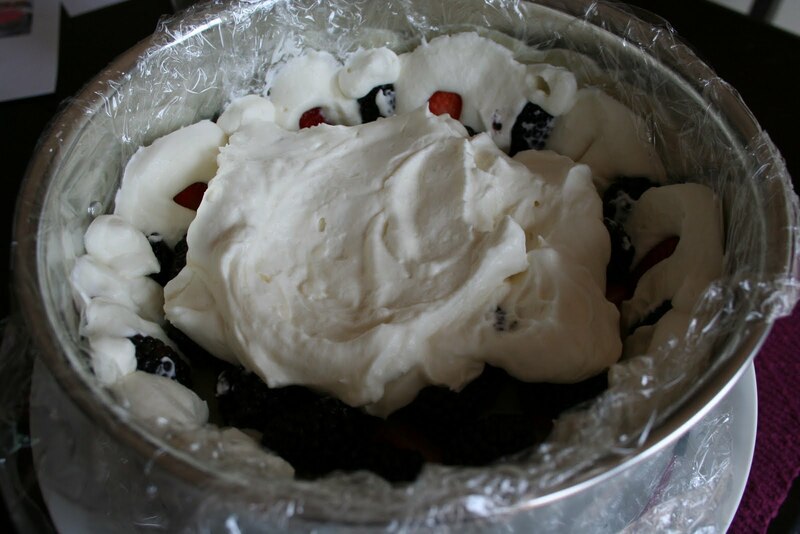 I can't wait to make the pastry cream again, I think it would be amazing with a strawberry shortcake dessert, or as a topping on a bowl of fresh fruit. I decided to keep the top of my cake clean and simple so that the amazing centre could shine through. The recipes for the chiffon cake and the pastry cream mousse were provided by Jana, and they are amazing! 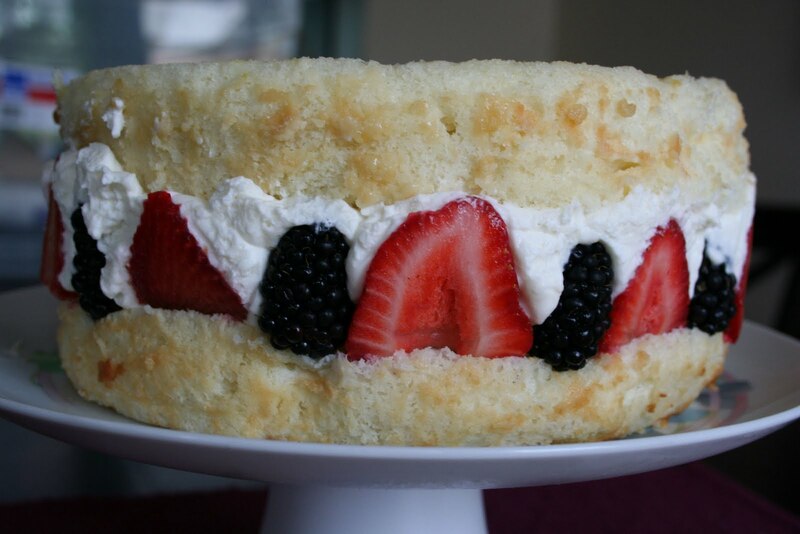 Yum - I love the addition of the blackberries, and the citrus chiffon cake sounds like the perfect complement to the fresh berries. Your fraisier looks magnificent! Your fraisier looks so light and fresh and tasty. I love the contrast of the blackberries and strawberries. I chose citrus too - there's something about a zingy sponge with cream and fruit. this was so fun to make, and so delicious to eat! all of you made such amazing desserts as well, i am so inspired for the next time i make one of these. for some reason blogger wont let me comment on any of your sites tho :( i'm working on it! The blackberries are such a nice addition. Well done! Wow. It looks really great! Thank you for sharing those ideas with us! I'll cook it as soon as I'll get a reason for it.